DVD Synopsis: Six rugged motorcyclists gather at the side of the highway to plan an excursion to Los Angeles. Although they appear to be the burliest band of bikers this side of the Hell’s Angels, they are actually cross-dressing madmen with an affinity for lipstick, high heels and braziers. 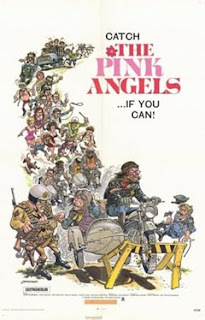 Pink Angels is the product of a different era, a window in time when the political and social climate allowed for a movie with openly gay main characters, yet hadn't advanced enough for said characters to be more than a source of campy humor. An exploitation comedy, Pink Angels isn’t a very good movie; it’s less a film than a series of comedy sketches, none of which blend together well. Also thrown into the mix are a handful of inexplicable scenes with an army general that go absolutely nowhere, and a bizarre folk soundtrack that seems way out of place in a comedy about gay bikers. Pink Angels is a curiosity, and not much more.